Pope Saint Pius V: One of the Leading Lights of the Order of Preachers! "He was a striking model of Christian humility and piety." Pope St. Pius V excelled in the praise of God. His thoughts were so occupied with God that in all things he preferred the honor and glory of God and desired nothing more, than that he should conform himself closely to God's most holy will. He reflected devoutly and almost without ceasing on the most bitter things that Christ the Lord suffered on our behalf, and to this end he was accustomed to keep an image of the crucified Savior before himself. 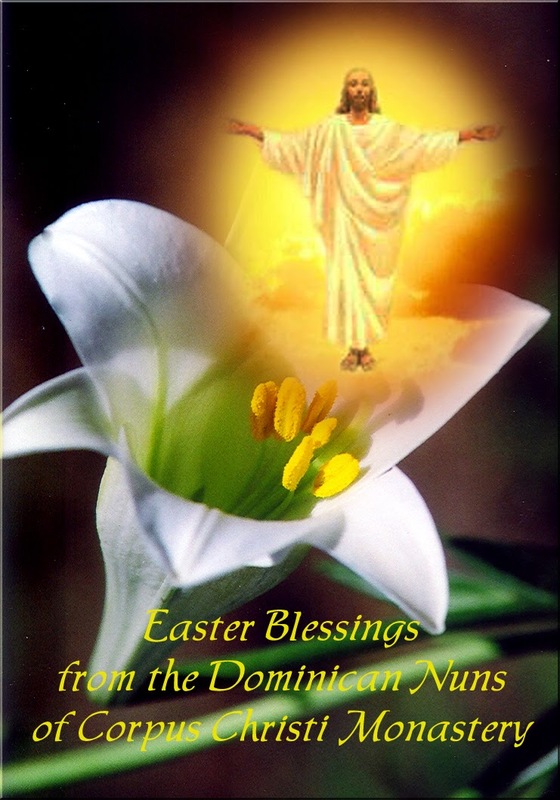 We would like to share with you an inspiring homily given by Fr. Ambrose Sigman, O.P. of the Western Dominican Province who comes to celebrate Mass for us once in a while to give our Chaplain a day of rest. 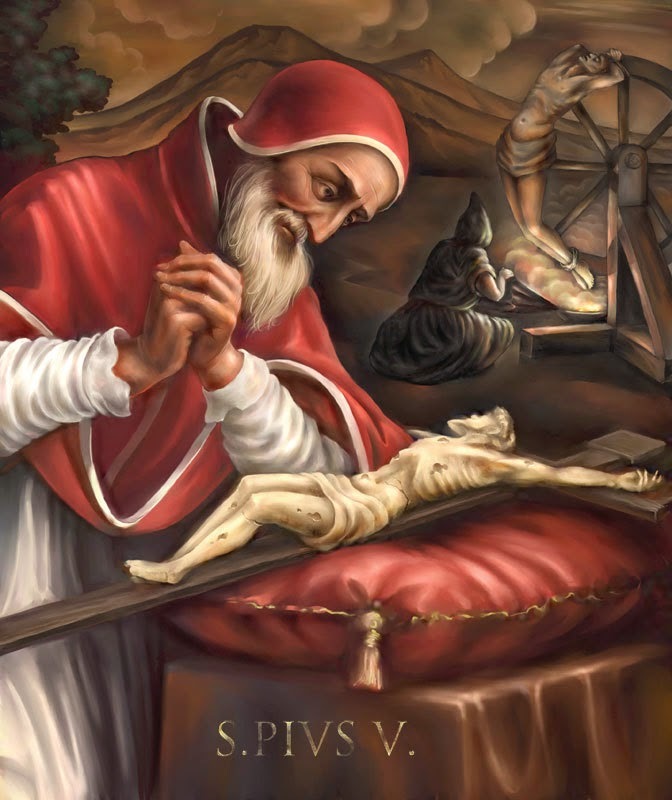 Today, the Order celebrates one of her greatest saints, one of her leading lights, Pope St. Pius V. Pope Pius, of course, is famous for a great many things, his implementation of the Council of Trent, and his commitment to the moral and doctrinal decrees of that council. He successfully ushered through the liturgical reforms called for by the council, with the Missal of Trent being known as the Missal of Pius V. And most famously of all, he was instrumental in the foundation of the Holy League, that collection of Christian nations and principalities which defeated the Turks at the battle of Lepanto. All that Pope Pius did can be traced back to a single source, a single reality, a reality proclaimed for us today by the Gospel of John, “God so loved the world that he gave his only begotten Son, so that everyone who believes in him might not perish but might have eternal life.” The proclamation of this reality was the life work of Pope Pius V, and it is a proclamation incumbent upon each of us who have committed ourselves to the work of the Order, be it through our words, our actions, or our way of life. The Gospel goes on further to describe the coming of the Son into this world as the coming of the light of truth, a light that is here to bring salvation, not condemnation, a light that exposes the darkness of sin and sweeps it away. Those who believe in this light will be saved. As Dominicans, we preach this light and this truth. Here again, we look to the example of Pope Pius V. Pope Pius, long before he was pope, was never afraid to proclaim this light with boldness. He was never afraid to correct those who wandered off into the darkness; he sought always to bring them back into the light. 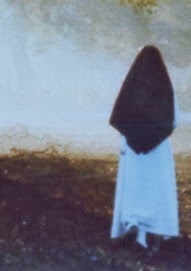 Sometimes, this meant being a witness to the light to the powerful. He is famous for having opposed his predecessor, Pope Pius IV, when that Pius wished to give the red hat to his thirteen year old nephew. The then bishop Ghislieri spoke against this move as an abuse of the Church. Pope Pius spent his life above all in efforts at reforming the morals of Christians and in proclaiming the truth of the faith. Pope Pius models for us a life lived in dedication to the light of Christ. Truly what St. John said could be applied to St. Pius V, “But whoever lives the truth comes to the light, so that his works may be clearly seen as done in God.” The strength and the courage to be bold proclaimers of the truth comes to us from God and His grace, graces which come to us especially in the gift of the Eucharist, the Body and Blood of Christ. Let us, then, look to the example of Pope St. Pius V and be inspired to proclaim the truth of Christ in all that we say and do, trusting in God’s mercy and love. May all that we do be done in the light that our own works may be clearly seen as done in the Lord. We pray that Pope St. Pius V may intercede for all our Dominican Friars so that their lives and their preaching ministry may radiate the light of Christ to our world darkened by disbelief and false hood. On this Divine Mercy Sunday, we rejoice with our Holy Mother Church and all the faithful in giving God grateful praises for his great love and mercy in giving us two new saints! "...The wounds of Jesus are a scandal, a stumbling block for faith, yet they are also the test of faith. That is why on the body of the risen Christ the wounds never pass away: they remain, for those wounds are the enduring sign of God's love for us. They are essential for believing in God. Not for believing that God exists, but for believing that God is love, mercy and faithfulness. Saint Peter, quoting Isaiah, writes to Christians: "by his wounds you have been healed" (1 Pet 2:24, cf. Is 53:5). Saint John XXIII and Saint John Paul II were not afraid to look upon the wounds of Jesus, to touch his torn hands and his pierced side. They were not ashamed of the flesh of Christ, they were not scandalized by him, by his cross; they did not despise the flesh of their brother (cf. Is 58:7), because they saw Jesus in every person who suffers and struggles. These were two men of courage, filled with the parrhesia of the Holy Spirit, and they bore witness before the Church and the world to God's goodness and mercy. They were priests, bishops and popes of the twentieth century. They lived through the tragic events of that century, but they were not overwhelmed by them. For them, God was more powerful; faith was more powerful - faith in Jesus Christ the Redeemer of man and the Lord of history; the mercy of God, shown by those five wounds, was more powerful; and more powerful too was the closeness of Mary our Mother. ...May these two new saints and shepherds of God's people intercede for the Church...May both of them teach us not to be scandalized by the wounds of Christ and to enter ever more deeply into the mystery of divine mercy, which always hopes and always forgives, because it always loves." 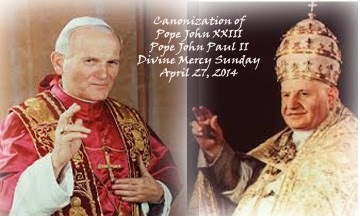 Watch the canonization of Saints John Paul II and John XXIII! Let us indeed be glad and rejoice. Heaven and earth can never fathom it!